It all started with the bourru wine I talked about in this post. Thanks to my sister, last weekend we got the chance to visit a seventh-generation, family-owned vineyard in Cour-Cheverny, a small rural town near Blois in the Loire Valley. After writing about bourru, Sébastien and I were wondering if it was only a tradition in Bordeaux to drink the fermented grape juice that hasn’t yet been turned into “real” wine. On our visit to the Domaine de la Marigonnerie, we had the chance to taste the Loire Valley equivalent, bernache, right out of the fermenting vat. Drinking this sweet, cloudy, fizzy grape juice wasn’t only special because we were able to see first-hand how wine is made, but also because we tried a couple different kinds. My favorite was the one made from the rare cépage “romorantin.” Also the name of a nearby town, this is a grape variety that was originally brought to the Loire Valley from Burgundy by Francois I in the 16th century. Today it is only cultivated in this region. Of course, “bernache” wasn’t the only wine we tasted. We especially enjoyed the AOC Cour-Cheverny, Cuvée “vieilles vignes”- a full-fledged dry white wine made from 100% “romorantin” grapes. We were told it would pair especially well with spicy foods- of course, the adventurous New Mexican in me liked that idea. We also enjoyed the AOC Cour-Cerverny, “Cuvée tardive”- a vin moelleux. 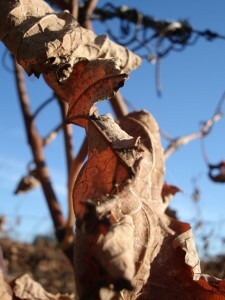 “Cuvée tardive” means that the grapes were picked later than for a dry wine and, therefore, have a higher sugar content. It was interesting to taste the difference between the dry and sweet wines of the same grape variety. Mr. Daridan, who runs the vineyard, joked that this wine would go well with Maroilles, a semi-soft cows-milk cheese made in the north of France and known for it’s very strong smell! I’ll keep you posted as soon as we try that one. For anyone who might be in the Blois area this December 5-6, the Daridan vineyard will be hosting an open house with tasting and sales of their wine and other local products. Check their website for more details and directions- they may come in handy on the small dirt roads! Next post: roasted chestnuts and white wine. This entry was posted in Wine & Cheese and tagged loire valley, wine. Bookmark the permalink.